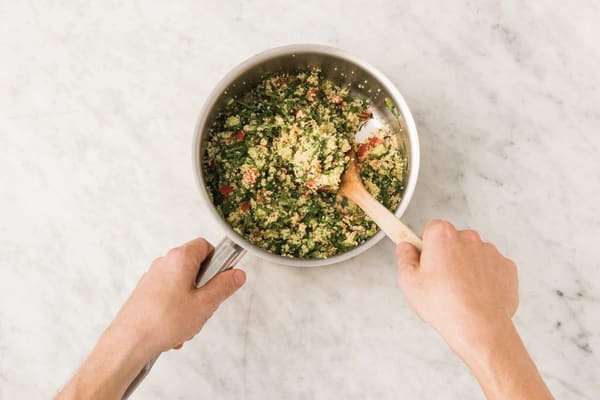 Couscous tabbouleh is a winning side dish – it’s fast, fresh and full of flavour. 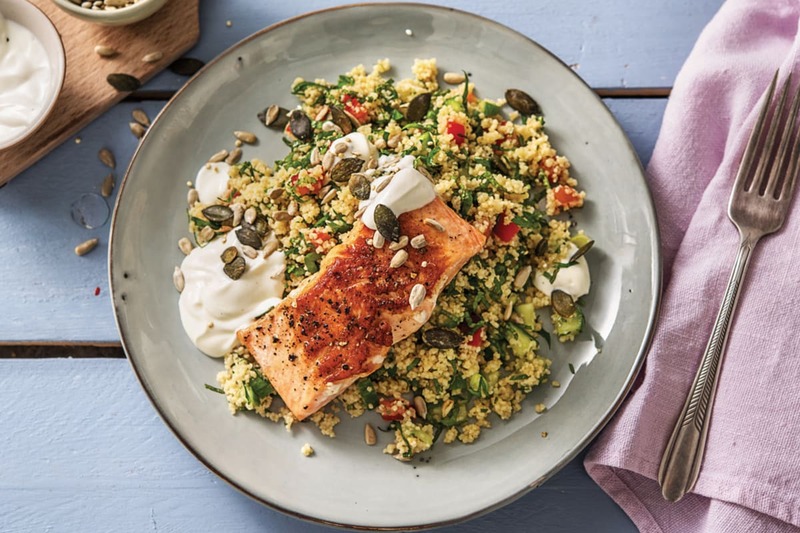 Serve it next to gently seared salmon and a lemon yoghurt, plus add a sprinkling of roasted seeds for extra goodness and crunch. This meal is a star performer! 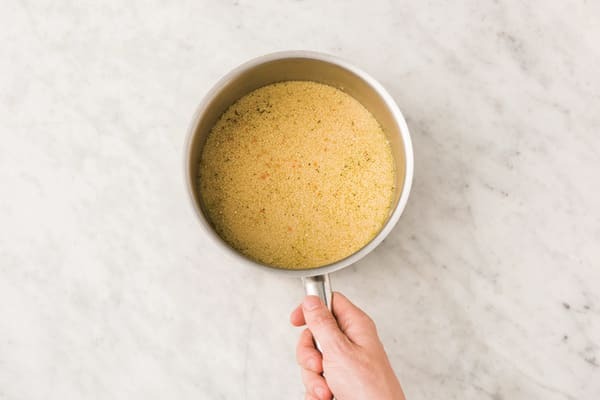 In a medium saucepan, combine the water (for the couscous) and the crumbled vegetable stock (1/2 cube for 2 people / 1 cube for 4 people) and bring to the boil. Add the couscous and a drizzle of olive oil. Stir to combine, place a lid on the saucepan and remove from the heat. Set aside for 5 minutes, or until all the water is absorbed. Fluff up with a fork and set aside, uncovered, to cool slightly. 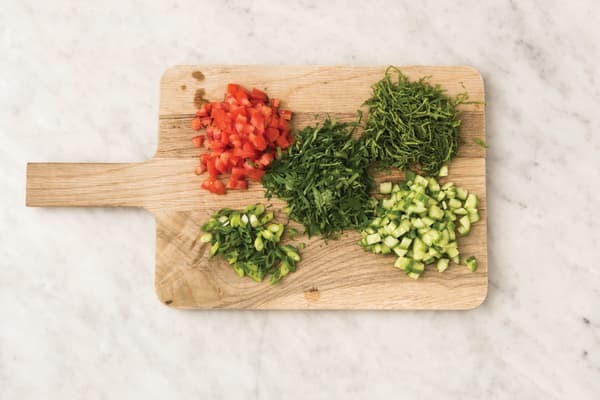 Finely chop the tomato and cucumber. Thinly slice the spring onion. Finely chop the parsley. Pick the mint leaves and thinly slice. 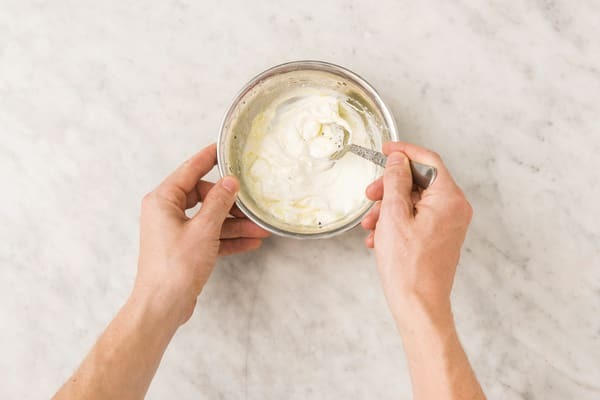 In a small bowl, combine the Greek yoghurt, a squeeze of lemon juice and the water (for the dressing). Season with salt and pepper, drizzle with a little olive oil and mix well. Set aside. In a medium frying pan, heat a drizzle of olive oil over a medium-high heat. Pat the salmon dry with paper towel and season both sides with a pinch of salt and pepper. TIP: Patting the skin dry helps it crisp up in the pan! 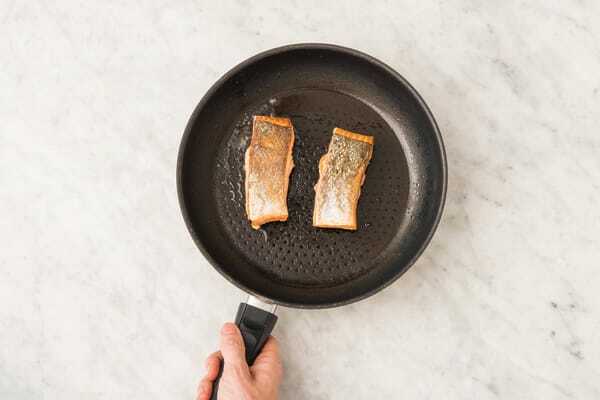 When the oil is hot, add the salmon to the pan, skin-side down, and cook for 2-4 minutes on each side (depending on thickness), or until just cooked through. Transfer to a plate to rest. 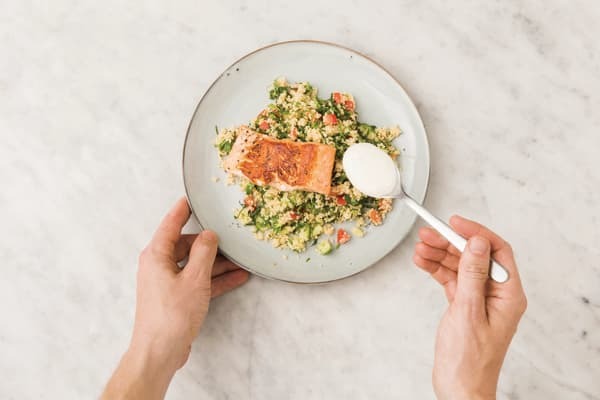 While the salmon is resting, add the tomato, cucumber, spring onion, parsley, mint and a squeeze of lemon juice to the saucepan with the couscous. Drizzle with a little olive oil and mix well to combine. Add the salt and a pinch of pepper. TIP: Add as little or as much lemon juice as you like depending on your taste.